A bit if a potted history blog for you today. I just adore advent calendars- I always have. Whether they reveal little chocolates, pictures, or even a Lego toy, there is something magic about that tiny moment of anticipation before the door of the day is opened! 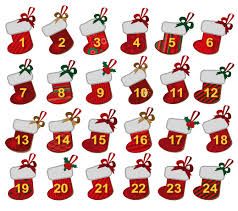 On the first of December, children all around the world will be opening the first door of their Christmas Advent Calendars, eager to see what picture, chocolate, or mini gift is hiding inside. The word “Advent” comes from the Latin phrase “coming toward.” For Christians, the period of Advent marks “coming toward” the most important date in their year, the birth of Christ. The idea physically marking Advent has its roots in late 19th century Germany when the Lutherans made chalk marks on doors from December 1st until the 24th. There are two contenders for the very first Advent Calendars. According to the Landesmuseum in Austria, the first one was produced Hamburg in 1902 by a protestant bookshop owner. Others claim that the first hand made calendar was made in Germany in the late 19th century for a child named Gerhard Lang. Lang’s mother stuck 24 tiny sweets to a square of cardboard, for her son to eat over the Advent period. This simple idea stayed with Lang and when, as an adult, he went into partnership with his friend Reichhold, they opened a printing office. 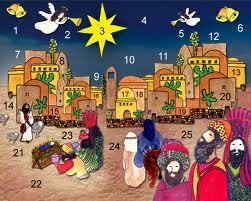 In 1908 they produced what is thought to be the first-ever printed Advent Calendar. This earliest calendar set the mould for those we see today, with small pictures, one marking every day between 1st and 14th December. A few years later, Lang introduced the concept of 24 little doors – giving each new picture an element of surprise. Lang’s business came to an end in 1930s, but the idea had taken hold, and others, such as the Sankt Johannis Printing Company, started producing religious Advent Calendars, often with Biblical verses instead of pictures behind the doors. The First World War bought rationing, and a temporary halt to the manufacture of calendars. 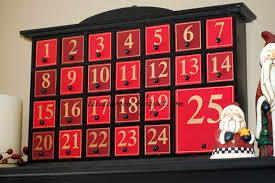 In 1946 however, when rationing began to ease after the end of the Second World War, a printer named Richard Sellmer reintroduced the Advent Calendars into the lives of children all over the Western World, and soon they became as much of a Christmas tradition as trees, cards and gifts.